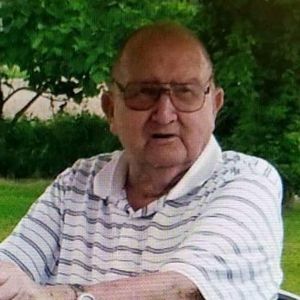 Herbert "Paul" Davis, 87, of Bladenboro, passed away on Saturday, February 23, 2019. He was preceded in death by wife: Frances Taylor Davis; daughter: Brenda Davis Cox; son: Timothy Wayne Davis; parents: Robert Isaac and Mary Dove Davis; three brothers: Terue, Dewey, Bryon Davis; two sisters: Larue Todd and Clara Thompson. Paul leaves behind his sister: Mamie Seals (Billy) of Bladenboro; children: Ellen Gause (Oliver) of Elizabethtown, Marie Jackson (Joe) of Bladenboro, Tommy Davis (Corinne) of Bladenboro, Bobby Davis (Lesly) of Elizabethtown, Jimmy Davis (Wendy) of Elizabethtown and Pam Davis Taylor of Elizabethtown; grandchildren: Jeff Gause (Tammy) of Bladenboro, Jamie Gause (Dalina) of Bladenboro, Buddy Gause of Elizabethtown, Billy Paul Cox (Christy) of Raleigh, Scotty Davis (Ruby) of Bladenboro, Matthew Davis (Torie) of Bladenboro, Blake Davis (Samantha) of Bladenboro; step grandchild: Brian Edwards of Bladenboro; great-grandchildren: Kaitlyn, Kailey, Karlee, Kyle, Kara, Jase; step great-grandchild: Brody and special caregiver Pamla Smith. Paul treasured his family dearly. He loved to hunt, fish, ride in his golfcart and eat Little Debbie cakes. He will be greatly missed. The family will receive friends from 7-9pm on Tuesday, February 26th at Bladen-Gaskins Funeral Home in Elizabethtown. A funeral service will be held on Wednesday, February 27th at 2pm at Oak Grove Original Freewill Baptist Church in Bladenboro with Rev. James Nobles officiating service. Burial will follow in the church cemetery. In lieu of flowers, memorial may be made to the Oak Grove Original Freewill Baptist Church 1423 Oak Grove Church Road Bladenboro, NC 28320 or Bladen We Care 418 Peanut Road, Elizabethtown, NC 28337. Add your thoughts, prayers or a condolence to Herbert's guestbook.